The expansive empire of Julius Ceasar rises again in the Caesars Empire Slot. The symbols of ancient Roman riches combine with icons of Roman strength as you spin the reels for fun, exitement and real money wins. Caesar brought a tremendous amount of wealth to the Empire and now you can experience that level of acquisition with spins, free spins, bonuses and more. You can play Caesars Empire slots on your PC or mobile device. Login to the casino and open the game. Choose your game mode — Free Mode for no deposit gaming entertainment or Real Mode for winning rewards. At a 95% RTP Caesar’s Empire offers slots gamers one of the highest payout rates in the gaming industry. Players have the opportunity to play at a low betting rate with only a 1 coin, 01 minimum bet. But if you’re looking for some big action you can wager as much as 3 coins at .25 per coin on each payline. Regardless of your betting preference you’ll enjoy a high quality casino event when you play Caesars Empire Slot on your PC or mobile device. 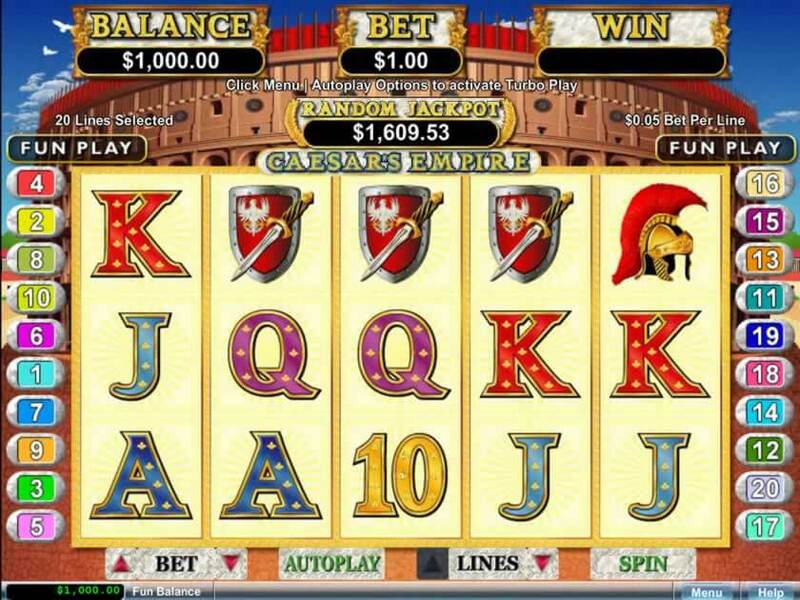 The Caesars Empire slot is a 20 payline machine that brings the symbols of ancient Rome to your gaming screen. As the reels spin you’ll see symbols of Rome including Caesar himself, a Roman helmet, a shield, a Roman stadium, a dish of fruits and traditional slots letters and number symbols. The Gold coin is the Wild. When it appears on the first, second, third or fourth reels it substitutes for all other symbols to complete paylines and trigger payouts. When the Gold Coin completes a payline it triples the payout. When two or more Coliseum Scatters appear, scattered in any position on the reels, activate a scatter combination payout that multiplies the total bet up to 100x. Both the Caesar and the Cleopatra Wilds award 2,500 coins whenever five matching symbols occur simultaneously on a payline. Whenever two, three, four or five Coliseum Scatters appear in any position on a regularl game spin Ppizes equal to 1x, 3x, 10x and 100x the total bet are paid out. You will launch the Free Spins game when one or more Caesar Wild appears on reel 1 at the same time that the Coliseum Scatter appears on reel 5 at the same time. During the free spins round players are awarded 10 free spins with a 2x multiplier on any free spin win. Every Caesar symbol that occurs on reel 5 awards 5 additional free spins. Caesars Empire is a progressive jackpot game. In addition to the wins from the regular game spins and the free spins round, players can compete for the game’s progressive jackpot prize by adding a small additional deposit. Once you’ve added your progressive deposit you can play your game as usual and collect your regular game wins. As the game continues you’ll vie for the progressive jackpot with Caesars Empire players from around the world. When one player, anywhere in the world, spins the spin that triggers the progressive jackpot prize, he’ll win the entire jackpot amount. That reward is comprised of all of the deposits of all participating players from around the world. Caesar’s Empire is a mobile-enabled game. You can play the game in the Download or Instant Casino Mode on your PC or at the mobile casino on your smartphone or tablet screen. You’ll have a dynaimc slots adventure with real money wins when you play Caesars Empire slot.